Bubba Watson is already thinking about his career after golf, which just might include public office. He wants to run for mayor. The two-time Masters champion already is building quite the local enterprise at home. Last year he became a part-owner of the Pensacola Blue Wahoos, a Double A affiliate of the Cincinnati Reds. This year, he opened a candy shop in Pensacola called ''Bubba's Sweet Spot,'' serving up premium candy and ice cream. And he didn't stop there. His latest venture is a car dealership, Sandy and Bubba's Milton Chevrolet (he thinks the new electric car is going to be big), along with a robotics company in Pensacola that makes everything from military equipment to toys. He has invested in a few golf courses, and he is involved in an apartment complex being built in Pensacola. Watson, who defends his title next week in the Hero World Challenge in the Bahamas, has 10 victories worldwide, and his PGA Tour earnings alone top $35 million. It's more than he imagined when he first reached the PGA Tour in 2006. But at 38, with two children, he's approaching a stage in is life when he's starting to think. He has lived in Orlando, Florida, and Scottsdale, Arizona, and North Carolina. He still keeps a home at The Greenbrier in West Virginia. But his future is near his birthplace of Bagdad in the Florida Panhandle, and he wanted to be sure to live in Pensacola to possibly run for mayor someday. So what would he do as mayor? Given a chance for some humor, Watson turned serious. INAUGURATION PLANS: Jim Herman will be going places he has never been in January. By winning the Shell Houston Open, he gets to start his year at Kapalua for the Tournament of Champions. And after the Sony Open, he is planning a trip to Washington to see one of his biggest supporters. ''I think I'm going to go to the inauguration,'' Herman said. Herman gave up on the mini-tours and was working as an assistant pro when he landed a job at Trump National in Bedminster, New Jersey. Once he was told that he would be playing with the boss – Donald Trump – Herman made a quick impression. Trump told him he was good enough to play the tour, and he helped financially back Herman, who eventually made it to the big leagues, and last year won his first PGA Tour event. Trump came to watch him in the FedEx Cup playoffs in 2015, not long after he announced his candidacy. And now he's the president-elect. Herman said he hasn't had a chance to talk to Trump yet. Trump will be at his Mar-a-Lago resort in Florida for Thanksgiving. 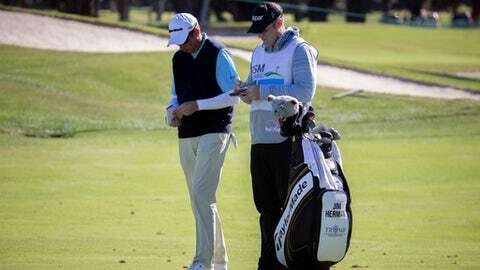 ERNIE AND ZAC: Ernie Els is thinking about signing up for the team event at the Zurich Classic, and he knew exactly whom to ask. Never mind that they are separated by 21 years in age and 60 victories. Blair loves golf architecture and often will go to the classic courses to play during tournaments or his weeks off tour. Els designs golf courses and has taken a liking to the 26-year-old from Utah. Blair said Els approached him about the team event, and he'd love nothing better than to play New Orleans with the Big Easy. TIME WARP: Mackenzie Hughes grew up near Hamilton Golf & Country Club, and he was the standard bearer at the Canadian Open in 2003. One of the players in his group that day was Steve Allan of Australia. Fast forward 13 years. Hughes won the Price Cutter Charity Classic on the Web.com Tour in August, all but assuring his PGA Tour card. Playing with him in the last group that day was none other than Allan. ''He had a huge laugh out of that,'' Hughes said. PHILIPPINES SCRAPPED: Rory McIlroy was supposed to play an 18-hole exhibition with Jason Day in the Philippines. And when Day pulled out to rest his back, McIlroy was to play against Dustin Johnson. And now no one is playing. The event fell apart when contracts could not be fulfilled. The 18-hole exhibition was to be held Nov. 29. The good news for Johnson? He never officially withdrew from the Hero World Challenge in the Bahamas and plans to be there. DIVOTS: Diana Murphy has been nominated to second one-year term as USGA president. … CME Group Tour Championship winner Charley Hull became the 15th player on the LPGA Tour to surpass $1 million in earnings this year. … A small consolation for Camilo Villegas and Henrik Norlander, who lost in the RSM Classic in a playoff, is that they get into the Sony Open in January by finishing in the top 10. Norlander has no status, and Villegas is a past champion. … Brooks Koepka won the Dunlop Phoenix in Japan, meaning his seven pro victories have come in six countries – the United States, Japan, Turkey, Scotland, Italy and Spain (twice). … Robert Allenby finished 10th at the Australian Open. It was his first top 10 in two years. … The World Cup of Golf will be the third time this year that Rickie Fowler (U.S.), Rafa Cabrera Bello (Spain) and Thomas Pieters (Belgium) play for the flag this year. They also played in the Olympics and the Ryder Cup. STAT OF THE WEEK: The last four PGA Tour events of 2016 were won by players ranked No. 448 (Cody Gribble), No. 451 (Rod Pampling), No. 271 (Pat Perez) and No. 287 (Mackenzie Hughes). FINAL WORD: ''I had a lot of fun doing it, even though a 9-year-old was taking the whatever out of me.'' – Rory McIlroy on his European Tour interview with 9-year-old Billy Jenkins, who grilled him on Zika, his favorite female tennis player and what clubs he will be using next year.